"It's hot, damm hot" said Robin Williams in 'Good Morning Vietnam', the forcast told us that today would be around 29 celsius, but it seems much hotter. s, Kale more so than the boy Bourne. 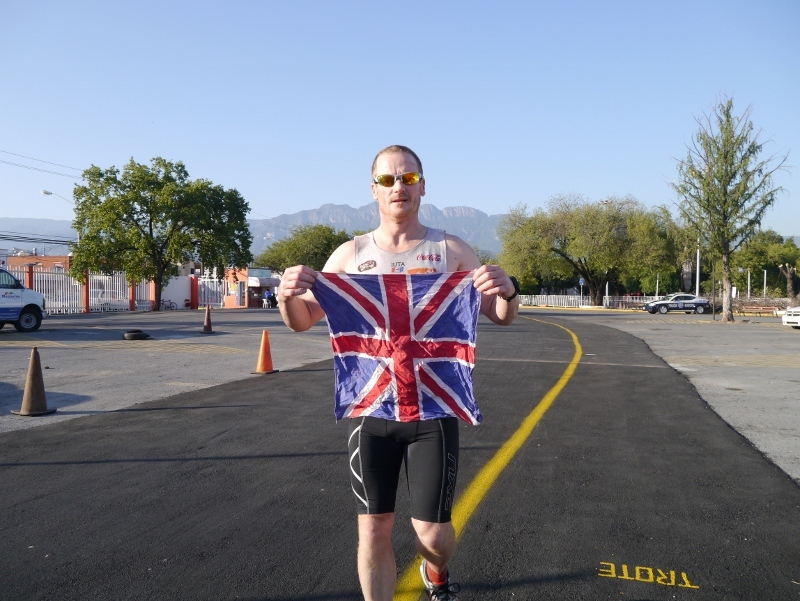 Our plan today was to complete marathon number 4 by 1530, but that went by the way side as Simon was falling asleep as he ran. So instead of an admin break at the half point, I got him on the doctors table covered him with my sleeping bag and bang........straight to sleep. 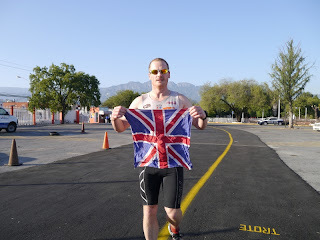 Did I tell you that the main road through Monterrey is 20 metres from where the race HQ is, if not you know now, the traffic noise is incessant but that does not deter a tired athlete from getting their head down. When he woke we fitted in the mandatory doctors check, he is 68 kgs, has a 65 resting pulse rate and 130/80 BP, not bad, not bad. His face is falling apart and the blisters have begun to appear on his face and feet, the worst on his big toe and under the pad at the front of the ball of his left foot which we will keep dressing, and his calf's have swollen, so we get those in the pool as often as practicable. Despite all that, he still managed to get back some of the laps this morning, taken by Kale whilst we slept well last night and this afternoon before the power nap, he had got back to somewhere near were he was, whilst Kale had to sleep. He is now a marathon in front again and is laping a lot quicker than Kale, we just have to manage his speed and keep his body together. Rock on Simon we're behind you. p.s. 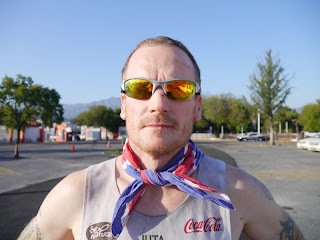 he completed the marathon at 1640.